And then there were four! 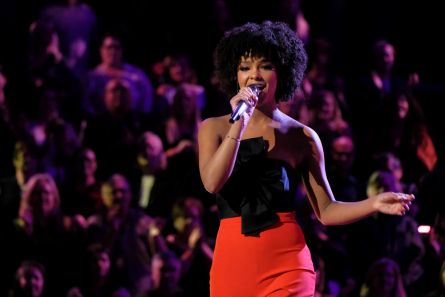 Team Kelly got an extra artist on Tuesday night during “The Voice” Live Results show when the winning Comeback artist chose to be on her team. 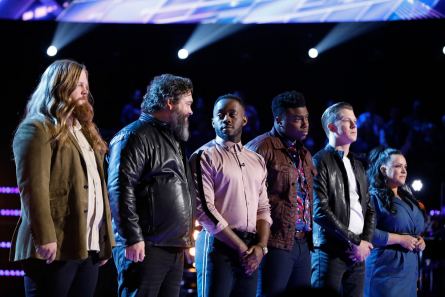 All other coaches – Blake Shelton, Adam Levine, and Jennifer Hudson were left with America’s top two selects per team, and a third choice that they picked to move-on to “The Voice” live shows next week. Thus, each coach was left with three members, except for Kelly who is moving into next week’s Live Playoffs with four. Monday night was filled with twenty-four artists’ performances as members from each Team performed a song. On Tuesday night, the Teams were whittled-down to only three members each, leaving us with a Top 12. But, with the addition of the member from The Comeback Stage, we are really left with a Top 13 this season going into the Live Shows next week. 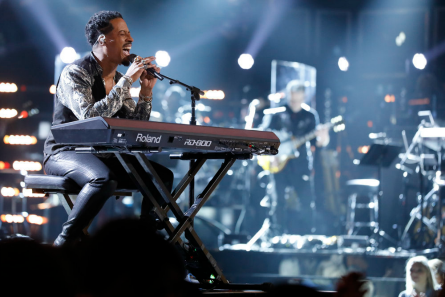 At the start of Monday’s show which kicked-off night one of the live shows for “The Voice” season 15, each coach commented on their artists. Blake stole Funsho from Team Adam. He said Dave Fenley will be hard to beat. Natasia has a powerful voice. Blake said you can hear the excitement in Kirk’s voice. Blake said it’s shocking to hear Chris open his mouth and that sound come out. He said his Team has heart, soul and passion and the next ‘Voice winner is on his team. First up was Michael, then Dave Fenley. Natasia sang “God is a Woman.” Chris Kroeze sang “Have You Ever Seen the Rain.” Funsho sang “How Long.” Kirk Jay sang “One More Day” by Diamond Rio. Kelly said her Team is full of “so many different genres of music” and looks forward to see how her artists will perform live. Kymberli Joye, Sarah Grace – who Kelly said sounds like an old soul. Kelly stole Zaxai and loves his “smokey” falsetto. Abby is soulful/Pop. She said she has an intense head voice. One of her favorites is Keith. Chevel is 16, and sounds like “Loretta Lynn meets Dixie Chicks” stated Kelly. Kelly considers her Team a threat. Kelsea Ballerini gave some artists a second chance during “The Voice” first ever “Comeback Stage.” The first two Comeback artists perfomed on Tuesday night’s ‘Voice live show. Next, “When Something is Wrong with My Baby” was performed by 16-year-old Sarah Grace who Kelly Saved in the Knockouts. Zaxai belted-out a remarkable performance of “When I Need You.” Country singer from New Mexico, Chevel Shepherd gave an impressive performance “Grandpa (Tell Me ‘Bout the Good Old Days)” which earned her the first standing ovation of the night from the coaches. Kymberli closed-out Team Kelly with an original take on Imagine Dragon’s “Radioactive.” Highly enjoyed by all. Adam said it gets “harder anad harder” and everyone on his Team is impressing him and improving. He called his Team the most diverse and eclectic. Kameron is the Country singer that Adam will try to beat Blake with. Adam called Tyke “a force.” Adam said “Reagan at age 14 is nuts (as in great!). He said Reagan “is ready.” Adam called Radha’s voice “nine feet tall.” She sang a Mariah Carey song in front of Mariah Carey. Adam said Deandre has charisma and doesn’t know how good he is. 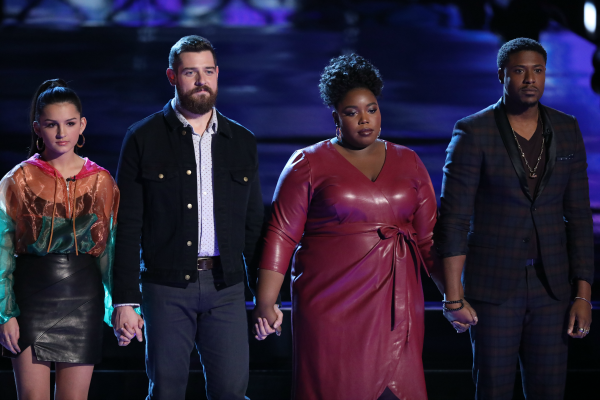 Patrique Fortson opened Team JHud with his soulful performance of classic ’80s hit “Ain’t Nobody.” He was followed by MaKenzie’s “I Believe in You and Me.” Franc West sang an on-point version of “Apologize” by One Republic while playing the piano. SandyRedd unleashed her inner Mary J. Blige with “No More Drama” song. Colton Smith proved he’s a powerhouse with his performance of “Scared to Be Lonely.” Then, 15-year-old Kennedy ended the night with her impressive “Halo” performance. The Top 13 were revealed at the end of Tuesday’s Live Results episode. The night also featured performances from Kane Brown and The Backstreet Boys. The top two artists from each team with the most votes from America, followed by the coaches’ votes are what produced this season’s Top 12, plus one member from the Comeback Stage gave us the Top 13. Each coach was allowed to save only one of thir remaining artists. Two artists in the Comeback Stage went “Voice to Voice” on the live ‘Voice stage. Viewers voted on Twitter for their favorite. The first Team to take the stage to hear the results was TEAM BLAKE. Michael thanked Blake for letting him be himself and honored to have worked with Blake. The first two artists to receive the most votes from Team Blake were – KIRK JAY, and CHRIS KROEZE. Blake saved DAVE FENLEY. That meant Funsho, Michael, and Natasia went home. Kane Brown performed. Host Carso Daly announced that Kane hit simultanous number ones on all five billboard Country Music Charts. Kelsea Ballerini Chose the final two artists in ‘The Voice’s “Comeback Stage.” The two artists chosen from this round, Ayanna Joni and Lynnea Moorer, were chosen to compete in the Live Playoffs. Ayanna chose “No Tears Left to Cry” to sing for her Live Playoff song. Jennifer said she must have what it takes in order to come out and perform like she did after not getting chair turns during the Blinds. Next, Lynnea sang “Boo’d Up” by Ella Mai. Kelly said she was so excited to find-out that Lynnea was in the top two to comeback. She added that Lynnea is a shinning example of “why the Comeback.” Kelly said the coaches are human and sometimes they make a mistake. Next, Daly announced that viewers had exactly five minutes to Twitter Save one of these Comeback artists. After the commercial break the live Twitter voting poll showed 15% of the votes for Ayanna, and 85% of the votes going to Lynnea. While waiting for all the votes to come in, Daly briefly interviewed the two young women. Ayanna said “It’s not over ’til it’s over” Lynnea agrred and stated to “keep trying” and “Opprotiunity keep coming your way.” Ayanna said Kelsie was amazing and showed them to “put it on the line” and go as hard as they can. Lynnea statted that she’s “a litte shy.” But, Kelsea taught her that she has to tell her story on stage. The Twitter Save vote went to LYNNEA. Then to top it off, Lynnea got to finally pick her coach. She chose Kelly Clarkson. Kelly was beyond estatic and rushed to give Lynnea her “Team Kelly” bomber jacket! FAN WEEK is coming-up in a couple of weeks where fans can suggest song choices to their favorite artists on the show. TEAM JHUD came out onto the stage. Daly asked MaKenzie about getting shoes thrown at her. She answered that it was the highlight of her life. Then, what does it mean to SandyRedd to be on “The Voice.” She answered that it means continuing her mother’s legacy and changing the world through music like she wanted to do. Then Daly announced the Saved votes. America saved MAKENZIE THOMAS, KENNEDY HOMLES. Holmes is the youngest in the competition. Next, Jennifer had to chose which artist to save. She reminded that she knows what this moment feels like. But, to take this opprotunity and make something out of it. “Take it from me,” she encouraged them. Jennifer selected SANDYREDD to take on into next week’s Live Shows. The Backstreet Boys took to the stage to perform “Chances.” After their performance, it was TEAM KELLY to find out their fates. Daly asked Zaxai about his friendships formed on the show. Zaxai stated that they titled their team “Team 15” and they fans of each other. Daly announced that America saved CHEVEL SHEPARD, and SARAH GRACE. That meant Kelly had to chose between Zaxai, Abby, Keith, or Kymberli. She had about one minute to decide. Kelly reirrated what Jennifer said to her team “this is not the end.” Kelly chose to keep KYMBERLI JOYE.